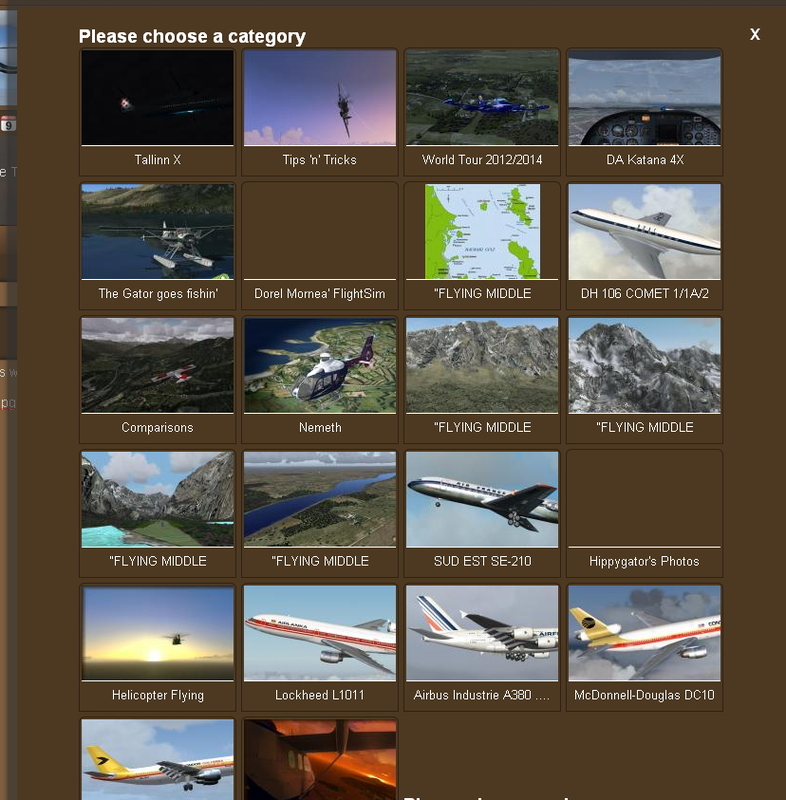 Clone That Shot » How to play "Clone That Shot"
Flight Sim Kloud » Games » Clone That Shot » How to play "Clone That Shot"
For any help you might need with this game, ask your queries here, but please specify that you need help with this particular game, as that "help" forum addresses the whole site, not just this game. Before anything, you must know that the images that are to be submitted in this game's forum posts, cannot be uploaded directly in the forum, the images need to be uploaded on external image hosting websites, and hotlinked in the game's forum posts. A good, free image hosting service would be imgbox.com. We'll henceforth refer to this action (the one written in red) as "submitting". Also, the screenshots must not be edited, they have to be clean, straight from the sim. "Clone That Shot" pretty much describes itself. Players are supposed to recreate or "clone" somebody else's screenshot. You start the game by navigating through the Screenshot Gallery and when you see a screenshot (which was not made by you) you would like to clone, fire up your sim and try to recreate that screenshot you've chosen as faithful as possible. Try to recreate as many elements as possible, time of date, season, weather conditions, aircraft model and livery..everything you can. When your clone is done, upload it to some image hosting website (such as the ones recommended above). 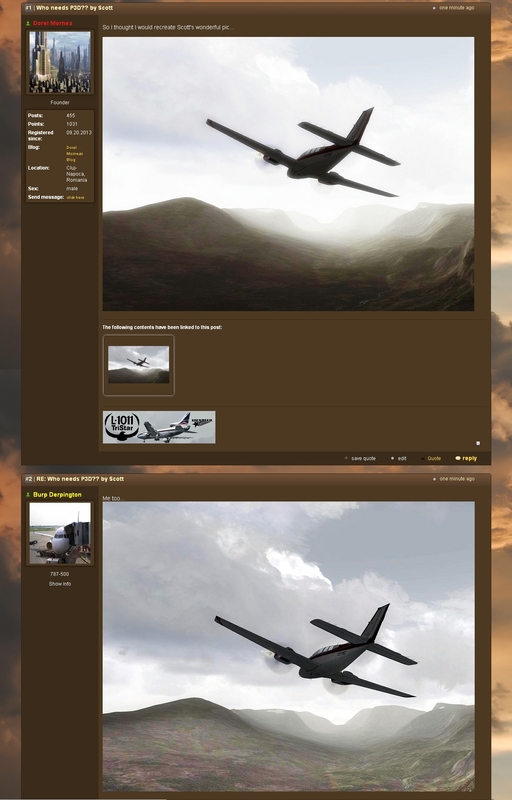 Next, open a thread in this game's forum section and include the name of the original author, who made the original screenshot (the one you chose to clone) as well as the name of the original screenshot in the name of your new thread. This will make it easy for the original author of the original pic, to take notice that his/her screenshot has been cloned and check it out, since his/her name as well as the name of his/her screenshot will appear in the activity feed on the homepage. Next, while in your new thread, click the "Integrate content" link found right above the textbox. 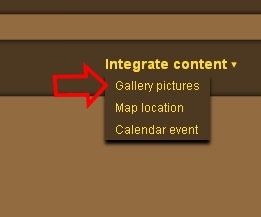 A drop-down list will deploy, now click "Gallery pictures". Next, you'll be presented with the whole Picture Gallery, in miniature, first you're going to see the 4 albums on the main page of the Picture Gallery, just select "Screenshots" and navigate all the way to the screenshot you've chosen to clone. When you find it, click on it, and it will automatically be added as an attachment to your thread, appearing as a thumbnail underneath the textbox. Clicking it, will take you to the page containing the original screenshot This is an elegant way of providing a direct link to the screenshot you've chosen to clone, inside the thread where you're about to submit your version (the clone) of that original screenshot. It may sound complicated, but only because of the number of words I use to explain it it really is straightforward and intuitive to use. Next, after you've linked to the original screenshot, you just need to submit (hotlink) your version (the clone) of the original screenshot. You do it the usual way, just copy the direct url of your screenshot (which by now should be hosted on an image hosting website) and hotlink it in your thread using the appropriate image embedding tool from the iconbar above the textbox. If you want, you can add some extra words about your experience cloning that screenshot, and then just post the thread. People can then reply with comments on what you've done. Right after you start the thread, you can go to Integrate content > Gallery pictures then navigate to the Screenshot Gallery, which is basically an album on the main page of the Picture Gallery; when you find the screenshot you've cloned, just click on it and it'll automatically attach to your post. After attaching the link to the original screenshot, found in the Screenshot Gallery, you can hotlink your clone screenshot. Just click the button intended for image hotlinking, from the toolbar above the textbox, the one highlighted in the following pic: After you click it, just paste the URL of your screenshot (which should be uploaded on an external image hosting website) where your cursor is (as a result of clicking the "image insert" button). I know these things are something waaay trivial, but...I like to make as sure as possible everyone gets it. As you'll see in the following image, the name of the original screenshot (the one you chose to clone) and the name of its author are appearing in the activity feed on the homepage, both when the topic is created and when someone replies to it, that's why only the topic starter needs to enter that info, when the topic is created. Like I said above, this makes it easy for the original author (as well as for everyone else) to notice that one of his/her screenshots have been replicated. 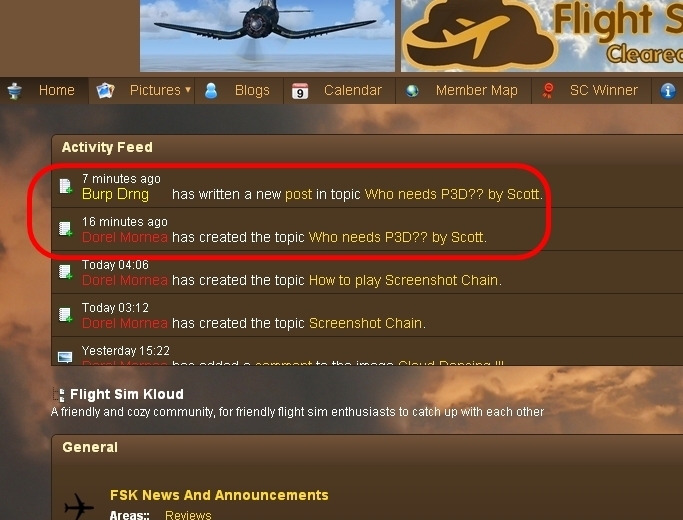 In this example, Dorel Mornea started the game by cloning one of Scott's screenshots (the one titled "Who needs P3D??"). As you can see, the first player, the topic starter (Dorel Mornea), included the name of the original author and the name of the screenshot he cloned in the topic title. Notice the attachment to the topic, underneath the clone image. That thumbnail attachment is that "elegant link" to the original screenshot that has just been cloned. Next, another player, Burp Derpington, decided to clone the same screenshot. Since a topic for that screenshot already exists (somebody else has cloned that shot before), all Burp has to do, is to submit (hotlink) his screenshot as a reply to the existing topic for that screenshot. A new topic is only needed when another screenshot is to be cloned.